On my personal site, http://peterme.com/, I’ve written a four-part series on how we rebranded Snagajob to Snag (Parts 1, 2, 3, 4). 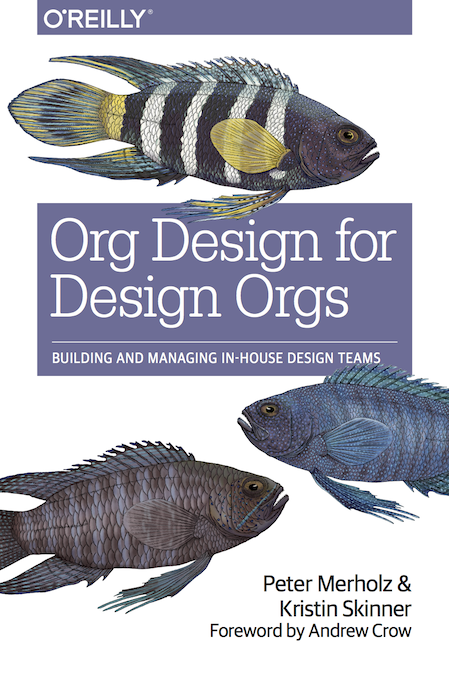 In the context of “org design for design orgs,” there’s a key learning worth sharing. Some context will help. Traditionally, when building internal design capabilities, companies distinguished design for marketing, which would report up through a marketing executive, and design for the product, which reported up through product management or engineering. This may have made sense in a pre-Web era where what was developed, and how it was packaged, advertised, and sold, were vastly different activities. Product design involved industrial design, hardware design, user interface design. Marketing design involved the design of the packaging, the sales support material, advertising across a variety of media. These activities were often outsourced to different kinds of firms that specialized in one or the other. In this post-Web, post-mobile era, where products are becoming services, and the media and modes of use are the same as the media and modes of marketing, these distinctions become blurred. Old Webheads like me saw this repeatedly in the early days of digital transformation. I worked with a number of traditional companies that had their marketing team in charge of the website, because they initially saw it as a platform for acquiring customers, only to then realize that the website was also a way for existing customers to conduct business (think online banking). These companies would have wholly different teams working on the “public” and “private” parts of the website, which would lead to vastly different designs and experiences pre- and post-login. As digital services evolve, these distinctions are meaningless. Is the home page of Snag a marketing page or a product page? The answer is yes. But if you have two different teams, reporting up to different executives, working on it, they’re distinct mandates (“drive acquisition!” “drive engagement!”) will conflict, and will cause consternation. This is why, in the book, we argue for taking a service design mindset, one that orients on the customer journey, and that recognizes that “marketing” and “product” are simply way stations on that customer journey, and what matters more is orchestrating that entire experience. In rebranding Snag, particularly in developing a new brand identity, I had marketing and product design leaders involved throughout. And I couldn’t have imagined it any other way – while marketing is responsible for how we communicate about our business, the product designers are responsible for the day-to-day interactions with our services, and those interactions define how people experience our brand. It might seem obvious to say, but I feel obliged to say it, as I know of rebrands that were wholly run out of marketing, where the product development teams were at best a stakeholder, and typically simply a recipient, of a style guide built without their direct input. Having marketing and product people work closely together to build our new style guide and design system made the brand identity work much stronger. And this works best when those marketing and product designers are on the same team, with the same boss, and have developed great working relationships over time, and aren’t just thrown together for the first time on something as hairy and arduous as a rebrand.